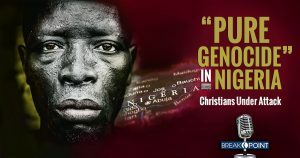 Our friends at the Colson Center for Christian Worldview released a commentary today highlighting the intense persecution Christians face in Nigeria and calling on America to condemn the atrocities committed against thousands of innocent civilians in that country. By most estimates, the population of Nigeria is almost evenly divided between Muslims and Christians. That religious split largely follows geographic lines: The northern part of the country is predominantly Muslim, the eastern and southern parts of the country heavily Christian. The middle, sometimes called the “Middle Belt,” is ethnically and religiously diverse. Not surprisingly, what makes Nigeria so dangerous for Christians originates in the Islamic north. There, Christians have been on the receiving end of a campaign Open Doors calls “religious cleansing,” that is, an attempt “to eradicate Christianity” from the region. . . . The Fulani are an ethnic group who are overwhelmingly Muslim, and their raids are not always at night. . . . The language used by Christian leaders in Nigeria in their statement to describe what is happening, “pure genocide,” is hard to disagree with. As was the call, directed toward the national government to “stop this senseless … blood shedding… and avoid a state of complete anarchy where the people are forced to defend themselves.” . . .
You can read Stonestreet’s entire commentary here. 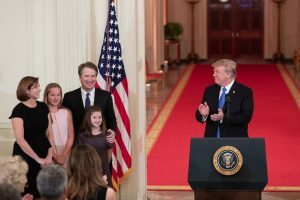 Last night President Trump announced the nomination of federal Judge Brett Kavanaugh to the U.S. Supreme Court. Judge Kavanaugh was appointed to the U.S. Court of Appeals for the District of Columbia Circuit by President George W. Bush in 2003. He was confirmed by the U.S. Senate in 2006, and has served as a federal judge for the past 12 years. However, as a federal judge, Kavanaugh has opined that the Office of Refugee Resettlement is not obligated to help minors in its custody obtain abortions. Although Judge Kavanaugh decided correctly in court case Priests for Life v. U.S. Dep’t of Health & Human Services, he wrote a moderate opinion disagreeing with the Priests on a foundational constitutional religious liberty principle. U.S. Supreme Court nominees are unpredictable. Many people pegged Justice Souter as a top-notch conservative when President George H. W. Bush appointed him to the court in 1990, but he proved to be anything but over the following 29 years. Excellent federal judges sometimes make poor U.S. Supreme Court justices — and vice versa. Unfortunately, it’s impossible to know how any Supreme Court pick will pan out until he or she has been on the bench a little while. Any potential nominee from President Trump’s short list of Supreme Court candidates likely will be more conservative than Justice Kennedy. As a swing vote, Justice Kennedy has been unpredictable. He sided with the liberal justices in decisions like Planned Parenthood v. Casey and the court’s Obergefell v. Hodges opinion striking down state marriage laws nationwide. On the other hand, Justice Kennedy helped the court rule in favor of California’s pregnancy resource centers just this summer. Justice Kennedy’s opinions have been mixed, at best, and it’s likely any nominee President Trump picks to replace Justice Kennedy will be more consistent and more conservative. Updated 7/11/2018: American Family Association has released a follow-up statement indicating that upon further consideration it has decided it will not actively oppose Judge Kavanaugh’s appointment for the time being. Video: Abortion Complications Sending Thousands of Women to the E.R. A new study shows abortion complications are sending thousands of women to the E.R. every year. The findings demonstrate that pro-life laws are necessary to protect women’s health. Watch the video below to learn more.